Open fiddler and replace actions.dat. The rule editor are as required. If you do not know how to replace, read the Tool's Tutorial from the link above. Load Pet Society using a SECONDARY account. If replaced correctly, the line will be highlighted in gray. Now, just visit a friend and search in the rooms for Hideeni. 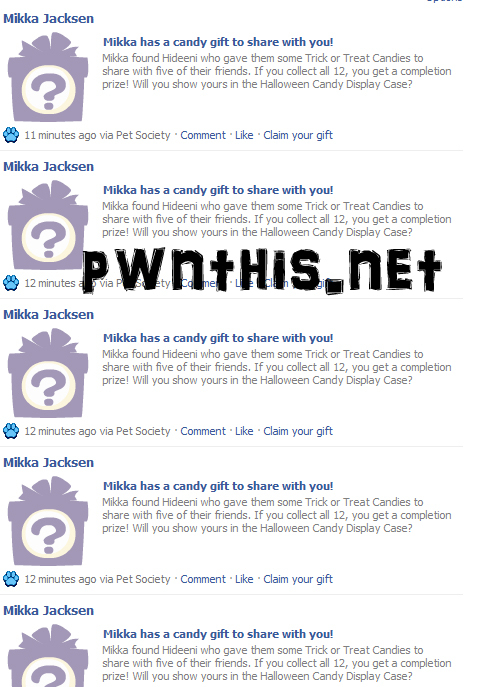 Once you found Hideeni, publish and share the Halloween Candy Gift. Keep clicking on the "By Wilander@pwnthis.net" speech bubble and you can keep publishing more Candy Gifts.